An ancient human like civilization exists on a planet like our own but warmer, with more deserts and smaller oceans. Climate change is forcing the daytime temperature slowly upwards. What measures might such a civilization take to protect itself from the increasing heat and roughly what sort of temperature would be survivable long term? I understand what ancient civilizations did historicaly, but I'm more interested in different approaches that might be used at higher temperatures. They have access to fresh water in deep wells refreshed by an aquifer charged by rain fall in a distant and inaccessible area. They are also near to the sea. The crops they grow have a similar heat resistance to the most heat resistant plants that grow in our desert regions. They are trapped in their current location by oceans and mountains so they can’t escape. Clarification concerning "ancient", "human like" and "civilization" This ancient civilization has no high tech, the human like beings only differ in insignificant ways from real humans. The answer can be based on any ancient human civilization prior to 400AD, but in the absence of any compelling reason otherwise I suggest the ancient Egyptians would be suitable. But their motivations would be more directed towards surviving in a warming environment than pyramid building. Two of my favorites for this scenario. Fresno is pretty close to what you describe. This guy Forestiere bought land sight unseen thinking he would grow fruit and nut trees but on getting there realized it was worthless. So he dug. When he got low enough, he planted the trees. 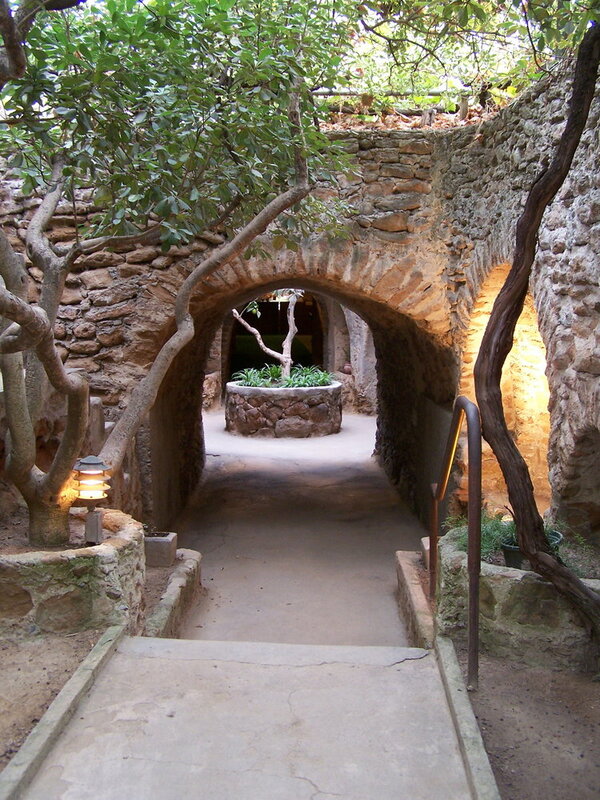 •A hand-built network of underground rooms, courtyards and passageways reminiscent of the ancient catacombs. •Unique fruit producing trees, shrubs, and vines growing underground - some over 90 years old! •Ancient Roman architecture - arches, vaults and stone-built walls. degrees! •Underground home of Sicilian visionary and self-taught artist/builder Baldassare Forestiere. The qanats are really excellent. They are ancient long distance underground waterways. Maybe when you state in OP that your people are getting water from distant rain and you are aware of the practices of ancient civilizations, you know about the qanats. 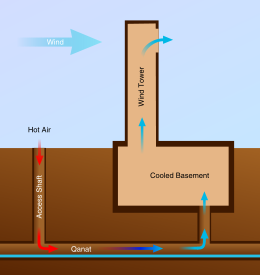 A think I think is really neat about them is that in addition to watering your plants, if you build over a qanat it can cool your house; air in the qanat is cool and you can pull it up into your house with the updraft from tall chimney. From linked Wikipedia. Water can locally reduce temperatures. This is why fountains are in public squares in hot places. Your folks are near the sea. I propose that surface saltwater canals could run through the communal areas of their cities. This would cool things a lot and could be useful for transportation too. 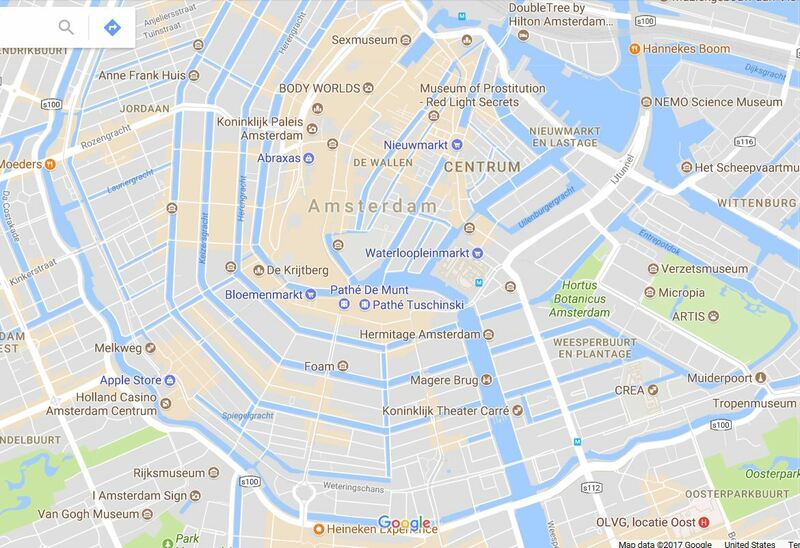 These could be connected to an estuary and so the water would flow back and forth according to the tides, or just be directly contiguous like Amsterdam, above. The moving water would absorb heat. One could have windpowered saltwater fountains as well for extra heat absorption. Having moving, nondrinkable water coming thru the city would also be good for sanitary reasons. I cannot think of an example of a desert city with canals like this - if someone knows one please link it up or feel free to edit this answer and add a screenshot. Much depends on how much fresh water they can harvest, either by wells or by desalinating sea water. To keep reasonably cool in hot climate needs a lot of water, to drink, in the first place, but also to cool down other things (animals and plants) less heat resilient. Human body can resist very high temperatures (up to 60°C and more, for shorter periods) with enough drinking water, but "useful" animal and plants have a narrower range. Humans and animals can also resort to bury into caves (just 20m underground temperature is almost independent from outside heat), but that is not the case for plants needing light to thrive. Being an "ancient" civilization it doesn't (supposedly) have access to means to pull cold water from some hundred meter undersea (close to 4°C), so they should resort to keep wet some large overhead cloth; evaporation can lower temperature under it more than 10°C, which may be enough... but will require a lot of water (using sea water is dangerous for salt accumulation which won't be healthy for plants). Heavy clay structures, with thick walls and deep windows to limit heat transfer (adobe). Water cooled structures: a large water reservoir on the roof, covered from direct sunlight put open to evaporation, connected to pipes in the walls. Would require a lot of energy pumping, but also doubles as a gravity based running water supply. Building inside a rock formation. Taking from David Eddings' Dagashi, they might keep talking to a minimum to preserve moisture, possibly developing a sign language. Are there large animals in your desert? Some might find a way to make a boat if the bones are large enough to make a frame and cover that with skin. That would be one way to escape. (Or if some areas have just enough trees to make a Polynesian-style ship.) If slavery exists, the wealthy would probably have human-powered fans akin to slave owners in the American antebellum South. The limit for long term exposure is that the wet bulb temperature has to be lower than their body temperature. Otherwise you can't discard the heat. Animals with a higher normal temp can tolerate a higher temperature. You can get some help by spending days underground, and doing your work during the night. Further to the answer above quoting the Forestiere Underground Gardens, caves have often been used this way throughout history. In some cases people used existing caves, but it was a natural step to engineer complete underground settlements, taking advantage of the thermal mass of the rock to moderate temperatures. The many cave systems in Cappadocia are a perfect example of this, where entire villages were built primarily underground. Cappadocia only had the houses underground, of course. The Forestiere Underground Gardens adds an extra element to this by also moving agriculture at least partially into the underground domain as well. Not the answer you're looking for? Browse other questions tagged science-based technology ecology climate-change or ask your own question. What conditions would lead a hyperparasite (whose host is itself a parasite) to develop civilization? What security measures can stop robbers from digging a tunnel into a cash vault? How might an advanced civilization separate astronomical amounts of Magnesium Ions from astronomical amounts Oxygen Ions?